Post by Kenneth R. Ramsley, Department of Earth, Environmental and Planetary Sciences, Brown University. All but one region of Phobos, the largest moon of Mars, is covered by hundreds of valley-like features, usually described as grooves. Most grooves are ~80 to ~200 meters wide and are found in groups of generally parallel members, or families [see Image 1]. Impact craters typically produce slow-moving boulders, and on Phobos there would be little gravity to halt their motions. Did boulders rolling across the surface of Phobos produce the grooves? To answer this question, using a computer model to calculate the fate of rolling boulders, we compare their motions to the geomorphology of the grooves. 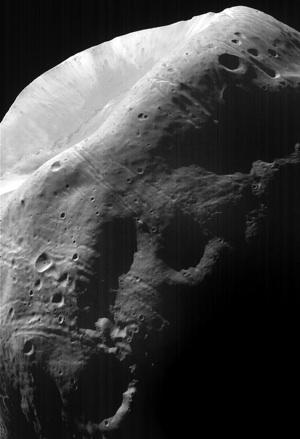 Image 1: Dominated by Stickney Crater, a feature nearly half the radius of the moon itself, Phobos is the larger of the two moons of Mars (average diameter, 22 kilometers). Mostly covered in valley-like features, planetary scientists have struggled for more than 40 years to explain the grooves of Phobos (Viking Project, JPL, NASA; Image mosaic by Edwin V. Bell II NSSDC/Raytheon ITSS). The image is of Mars’s 27 x 19 km satellite, Phobos. It hints at many mysteries that await us there. The surface (contrary to the appearance of this well-exposed image) is dark black, probably similar to carbonaceous asteroids, but the exact composition and spectral properties are still uncertain (due partly to scattered reddish light from Mars). Spectra show the surface soil lacks any water, but that soil has been blasted off and recycled through dust belts circling Mars, and then re-accreted onto Phobos. This process likely removes any initial water from the dust, so we can’t be sure whether the surface represents the interior material.